We are a family run business who are based just a short drive from Bathgate. 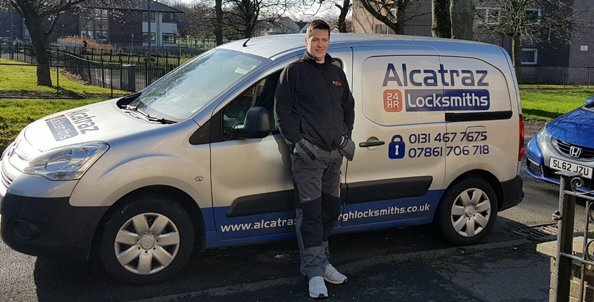 We have been delivering a locksmith Bathgate service for around 6 years now, and are growing year on year. As you would expect, we do all the jobs you would expect from a locksmith company, such as installing locks, opening locked doors, and UPVC door repairs. The only difference: our prices are affordable! We always give a phone quote before we go out to a job. This way the customer knows what they will pay, and can make up their mind if they want to proceed. All quotes are fixed price and are never increased. Our usual price for any type of lockout is around £60 (some companies charge double this). The normal price we charge for lock changing and repairs is £50, plus the price of any parts used. Any parts that are used are charged at the high street recommended retail price. Because we are a small company we operate under the VAT threshold. This is by no means an accident. We could go over the threshold at any given time, if we choose to. However, we stay under the threshold for 2 main reasons. Being under the threshold means we can make our prices 20% cheaper for the customer. This may not seem a lot, but if someone is getting around £200 worth of work done at their property, their bill would shoot up by £40. We know this is a lot of money for most people so by staying under the VAT threshold, we can stay cheaper than most other locksmith firms. The second deterrent stopping us going over the VAT threshold is paperwork. Once over the threshold, you kind of become an unofficial tax collector. As well as having to keep all the vat receipts, a few extra tax returns have to be filed every year. They way we see things at Alcatraz Locksmiths we already make good money for the work we do, why give ourselves extra stress?